The P No.2 was launched in 2005. Since then, this Torpedo has quickly become very popular. The pointed shape greatly contributes to the full bodiness of the cigar, as the rich flavors are intensified into one point of passage. 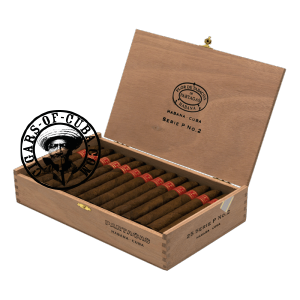 The familiar Partagas peppery flavors are present but dominated by the power of the tobacco. This cigar is especially suited to smoking outdoors. The pyramid size is highly demanded and appreciated, allows smokers to taste all the nuances in Partagas special blend. This brand stands out for its unique flavor and character, its high quality standards at every stage and a brand image that happily combines tradition, modernity and class thus building up a trend for years to come. It's a great cigar but don't ever compare it with the Partagas Piramide Limitada 2000!